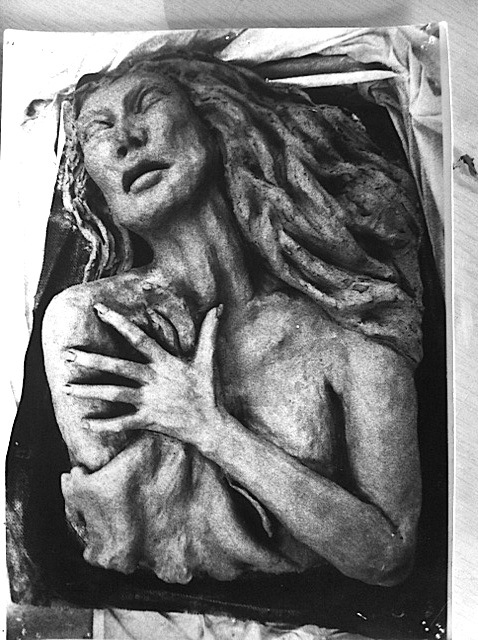 Clay sculpture done way, way back in high school circa 1979, and if memory serves she was nearly 3 feet in length and pretty darn heavy. This entry was posted in Life in General, My Art & Writing, My Writing and tagged afterlife, art, clay, death, depression, disease, dreams, faith, hospice, poetry, sculpture, self-awarness, spirituality. Bookmark the permalink. 1979, my grad year from high scewl. heh… 😉 Cool sculpture, do you still have her? Did you create that piece? It is very good! It almost seems as though the individual is in conflict with an external force. I’m not certain about “blinding white silence,” as I do not wish to experience that transition until it is my time to do so, but I have heard people saying that they believed that others who have transitioned from this life into the next knew that it was their time leave. I believe that it may be possible based upon some of their activity prior to leaving here. Yes, I sculpted this back in high school (seems like lifetimes ago). I can’t remember what moved me to sculpt her. I do remember her image appeared in my brain when I was thinking of trying my hand at – sculpting a hand. Can’t get Nina off my mind of late. You’re hitting homeruns, my friend. I’m hitting pop flies. Fabulous fifth graders – it will be fun! I also made this tall rearing horse – but alas – reaching up on 2 legs, he never stood a chance. Thank you, Steven. I truly appreciate.